There is an ongoing debate over whether Gorean free women may be warriors or not. Obviously if you do not choose to role-play closely to the Gorean novels, you may add anything to your role-play that you choose. You may have dozens of female warriors or even lands of Amazons. But, if you are concerned about remaining faithful to the books, then the question has much more relevance. Norman did not explicitly lay out guidelines for the place of female warriors on Gor but he did provide ample evidence to show his opinions on the matter. Thus, as for all other Gorean matters, you must consult the novels for an informed answer. The first step in the analysis must involve defining our terms. There are three basic terms to understand: Warrior, Rarius and Warrior Caste. Our greatest concern is with the last term as that is the crux of the controversy. A warrior is simply one who battles, armed or unarmed, in combat. That is a very broad term and can encompass males and females. Any one can pick up a weapon and fight in a war. Thus, any woman could fit this definition. But, the answer is far from that simple. When we refer to female warriors on Gor, we are not just considering this definition. We are referring to the deeper issue of the proper place of female Warriors on Gor. Rarius is a Gorean term that refers to warriors in general. Rarii is the plural form. It applies to any warrior from any culture and not just a member of the Warrior Caste. For example, a male Tuchuk or Red Savage may be referred to as a Rarius. By examining the word, we can also see that it ends in a common masculine suffix, like the word "kajirus." This gives us our first evidence that warriors on Gor are meant to be male. Though, the books never specifically state that "rarius" only applies to men, there is no example where it is ever used for a woman. And if it also applied to women, there would be a term with a feminine suffix such as "raria" that existed. No such term exists in the novels. In the civilized cities, there also exists a Caste of Warriors, the Red Caste. This Caste is one of the five High Castes on Gor. Men and women may belong to this Caste. The greatest confusion and questions deal with the role of women who belong to the Red Caste. What is their proper role in the Red Caste? May women of the Red Caste train, use weapons and act as a Warrior? May such women defend their cities in time of war? What are the duties and responsibilities of such women in their Caste? To discern the answers to these questions we must consider a two-pronged inquiry. First, we must decide if women are capable of using a warrior's weapons. Are they physically able to wield a sword or spear? Second, if we answer positively to the first question, then we must decide if the Warrior Caste and Gorean society would permit women to wield weapons. In such a male dominated society, would women be permitted to act as a Warrior? It is legal for them to possess and use weapons? In answering this first prong, we must understand that we are discussing Gorean women and not Earth women. Do not judge Gor by the examples of female athletes on Earth. Such women do not exist on Gor. Gorean culture is vastly different and has led to a different development for women. Even those Earth women brought to Gor are not Olympic athletes, bodybuilders or such. They are usually academics or business women. On Gor, women lack the strength to use some weapons of the Warriors. "The strength of a full-grown woman is equivalent to a twelve-year old boy." (Tribesman of Gor, p.223) Women do not possess the strength to wield longbows or Alar axes. There is a Peasant saying that "he who can bend the longbow cannot be slave." As all women are unable to bend it, they may become slaves. The books give examples showing the inferiority of the strength of women. Even the strongest of Gorean women is seen to be the inferior of the average Gorean man. In Tribesman of Gor, there is a masculine female slave who terrorized the rest of the kajirae. Yet, she was beaten by an ordinary male slave, not even a fighting slave. Mercenaries of Gor explains about a strong woman who no other woman could take a piece of bread from. It was stated that any man could have easily taken the bread from her. "She was a large girl, and formidable to us,…, but, compared to the men, she was only another female, no different from us. Compared to them, her size and strength, really only that of a woman, was, like ours, when all was said and done, simply negligible. Compared to them she was, like us simply small and weak. Before them, and to them, she could never be any more than we, only another female, small, lovely and helpless, a mere female, totally at their mercy." (Dancer of Gor, p.107) These statements apply to all men and not just warriors. The average Gorean man, of any caste, is stronger than any Gorean woman. "It is nothing for a man to overpower a female." (Tribesman of Gor, p.143). Many free women carry daggers or poisoned needles, small weapons, which are manageable by them. They rarely carry any larger weapons. But, a woman must rely upon surprise to be effective with these small weapons. Otherwise, she is still defenseless with such weapons as any Warrior or trained Slaver would be able to easily disarm her. It is even seen by some Warriors as a pretension for a woman to carry such a weapon. Some warriors get very offended if a woman dares to raise any weapon against them. Some freewomen in Ar once wielded axes and clubs to attack a paga tavern. They were quickly disarmed by a group of men. There are some examples of women in the novels who act as warriors, wielding weapons, but who do not belong to the Red Caste. Panther girls and talunas are the two main examples of this and these examples point out some interesting points concerning our questions. Taluna is not a synonym for panther girl. They are two distinct peoples though they share some similarities. A panther girl is a woman who lives in the northern forests of Gor. They are escaped slaves and free women who live by hunting and trading. They hate men and enslave those they capture. They hunt the panthers that roam the forests. They wield spears, bows and knives and can actually be excellent archers. Yet, panther girls do not wield swords. Talunas are white girls who live in the jungles near Schendi. Taluna is an inland dialect word for these girls. It is not a Gorean word. They too use spears, bows and knives but do not wield swords. Panther girls and talunas do not visit the cities of Gor. They primarily remain in their forests or jungles. If they entered a city, they would most likely be enslaved very quickly. This is because both groups are considered outlaws and outlaws are forbidden entrance to almost all cities. Impalement is a common punishment for outlaws though female outlaws are more often subject to enslavement. Panther girls might possibily be seen at the Sardar fairs where a truce exists and they can safely walk around. It would be a lengthy trek for talunas to attend the Sardar fairs so it is extremely unlikely they would ever attend one. The Panther Girls of the northern forests and the talunas of the rainforest are female warriors who live in isolated areas of Gor. Yet, none of these women wield swords. They primarily use spears and bows. They have apparently learned these skills on their own and were never trained by men to use such weapons. Unfortunately, the books do not say anything about the training of such women. In other isolated and barbaric areas, the women do not engage in combat. The women of the Wagon Peoples, the Red Savages, Torvaldslanders and the Red Hunters do not engage in combat or hunting. So why did the Panther Girls and Talunas develop such skills? First, these societies are female only groups. The only males that exist within these communities are slaves. Thus, the women must generally rely on themselves to hunt, fish and defend their bands. Second, these women live in wilderness areas, facing natural dangers on their own. It is essential that they possess certain skills to survive in such perilous areas. Third, these women are generally anti-men and feel they must prove themselves the equals or betters of men. They wish to be self-reliant and prove they have no need for men except as a slave. Despite all this, such women are said to make excellent slaves if they can be captured. In the civilized cities, there are two examples in the books of free women using bows, a short bow and a crossbow, to hunt. These appear to be women of means who enjoy hunting as a sport. One woman hunts tabuk while the other hunts a male slave. Both rode tharlarions and one even wore hunting leathers. Though both do end up as slaves, their use of the bow is not questioned. Thus it appears that some women did hunt with bows though it is obviously a dangerous pasttime. But again, neither of these two women used swords. They also only hunted and did not engage in actual combat. There is a single example of a woman wielding a sword, with any type of skill, in the novels. There are other examples of women using a sword but they are generally where a woman picks up a sword on the spur of the moment to aid someone in distress. In Tarnsman of Gor, Talena picks up a sword and cuts off a man's hand to protect Tarl Cabot. Though she was a member of the Warrior's Caste, she had no training in using a sword. In Raiders of Gor, a woman uses a sword during an attack on Port Kar though she has no training in the weapon. Any damage these women did was basically a lucky strike. Our only skilled combatant was Tarna, a bandit chieftain of a Tahari band, depicted in Tribesmen of Gor. 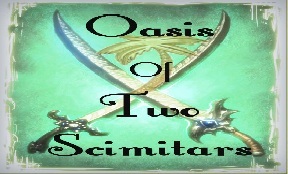 Tarna wielded a scimitar, the curved sword of the Tahari. S he was not a member of the Red Caste or actually any Caste. During a bandit raid on a well in the Tahari, the men note that the strangest thing about the raid was that it was led by a woman, Tarna. Tarna had not attained her position as bandit leader due to her combat skills. She was a tool of the Salt Ubar, himself an ally of the Kurii, and it was he who placed her at the head of her band. The men that followed her had little if any honor. They destroyed wells, a most grievous crime in the Tahari. No honorable bandit would ever have done so. Tarna's men follow her because of the Salt Ubar and not her own prowess. The Salt Ubar himself had little respect for her abilities and eventually relieved of her command. The plan had always been to use her and then enslave her once her usefulness was over. Tarna claimed to be more skilled with her blade than any man but this was only empty boasting. No one else ever supported her allegation. When she first met Tarl Cabot, she begged to be his slave. Near the end of the novel, Tarna and Tarl fought a duel. Tarl claimed that she was not unskillful but that she was not a match for a Warrior and that there were many men who could have finished her easily and swiftly. It must be noted that he does not compare her to any other female warrior. He compares her only to male warriors. If other female warriors had existed, he would likely have rated her according to them and not men. Tarl toyed with her during the duel, trying not to tire her arm by defending with his full strength. He easily defeated Tarna. Thus, we do have an answer for our first prong of the inquiry. Women, due to their lesser strength, have trouble using some of the weapons of the Warriors, especially the sword. Some are capable of using such weapons as the bow and spear. In general, those weapons are often used for hunting. But, these women would not be a match for a male Warrior. In a sword fight, they could not compete on equal grounds. Overall though, it is technically possible that women could use some weapons of the Warriors. As we have answered positively to our first inquiry, we then must consider the second prong of our inquiry, would Gorean society allow female Warriors. Free women belong to almost all of the Castes on Gor except the Initiates, Players and Assassins. Free women may be either born into their caste, change to the caste of their Free Companion or be promoted into it due to their skill. When a woman joins with a Free Companion, she has the option to accept the caste of her mate. But, if she chooses to keep her caste, her children will still take on the caste of their father. A show of ability can also raise her caste. To change caste by skill, the High Council of the city must approve it, based on your qualifications for the new caste and the willingness of the new caste to accept you. Women are promoted by the same criteria as men though it varies from city to city. There are examples in the books of women attaining the Red Caste by birth and Free Companionship, but never by skill. In actuality, women often do not perform the work of their Caste. Women of the Metal Workers do not commonly work at a forge and women of the Builder's do not supervise the construction of fortifications. In general, women do not perform Caste activities that require a degree of strength. But, women do commonly work as Scribes and Merchants. There are even female slavers. Another notable exception is that of the Physician's Caste. But, there is never a mention of any women practicing or learning the skills of the Warrior Caste. The Physician's Caste commonly restricts women in one way in the performance of their Caste duties. In many cities, the Caste will not permit a woman to practice medicine until she has first born two children. In many cities, at age fifteen, a woman of the Physician's Caste dons two bracelets. One is removed for each child born, and when both are removed, she is allowed to fully practice medicine. The reason behind this is that it is understood that professional women tend not to reproduce themselves. This would serve over time to diminish the quality of the caste. Thus, the rule helps to preserve the future of the caste. The future of a caste is vitally important to Goreans. The welfare of the caste takes priority over the ambitions of specific individuals. The welfare of a larger number of individuals is more important than the welfare of a smaller number of individuals. Caste is crucially important to Goreans in ways that those of Earth cannot easily comprehend. The importance of the caste to Goreans cannot be underestimated. Thus, the logic behind this restriction on women in the Physician's Caste would very likely also apply to the Warrior Caste. Why would the Warrior Caste allow women to risk their lives in combat? First, such women would be less likely to bear children as a pregnancy would inhibit their combat availability. Second, women dying in combat would also lead to fewer births. In addition, dead women could not raise their existing children. Goreans would not want their children to grow up without mothers. Women do most of the raising of children during their formative years. This would serve to diminish the quality of the caste over time. With the welfare of the caste at stake, Warriors would not permit women to engage in combat. In addition, women would not want to endanger the welfare of the caste so they would accept their role in the Caste as noncombatants. This reasoning is never specifically applied to the Warrior Caste but the logic is quite clear and should hold even stronger for the Red Caste than for the Physician's Caste. This may be the strongest single argument against female Warriors. There is no instance in any of the Gorean novels where a woman was trained by the Warrior's Caste to fight in battle or to wield weapons. There are examples of woman who acted as warriors but they did not belong to the Red Caste. Though there is no explicit prohibition in the novels that would prevent women from being such trained, it has yet to happen in the books. Dragons are not specifically excluded from being on Gor anywhere in the books. But, that does not mean that they could exist either. Based on the supporting evidence and arguments in the novels, women would never be trained as Red Caste warriors. In Outlaw of Gor, the city of Tharna is described, a city that was once dominated by women. It was ruled by a Tatrix and women were in most positions of power. But, no woman was ever said to be a Warrior, guard or any similar position. Only men wielded the weapons in this city. In Corcyrus when it too was ruled by a Tatrix, there were no female warriors ever noted. If even in female dominated cities only males acted as Warriors, why would any woman in any other city ever be trained as a Warrior? Some people feel that Red Caste women will battle if their city is attacked. The novels detail a number of attacks made against various Gorean cities. In none of these examples are there any female Warriors fighting to defend their city. Women only defend themselves from raiders seeking to capture them. And in these cases, they basically wield only daggers and needles. They do not use swords to defend themselves. In many cases, women actually surrender to the successful attackers in order to prevent themselves from being slain. When Ar was being attacked by the might of Cos, the idea of freeing and arming male slaves was considered. No one ever considered allowing women to fight. So, what is the role of females in the Warrior Caste? First, it is to bear and raise children to maintain the future of the Caste. This is an accepted function by free women who truly care about the welfare of their Caste. Second, as women care for children during their formative years, they are responsible for some of the education of their children. This likely would entail teaching them some basics of the Warrior Caste codes, instilling important virtues at an early age. It is doubtful women learned all of the intracacies of the Warrior code but it seems apparent they would know the basics. For example, in Tarnsman of Gor, Tarna is aware of one aspect of the Warrior code, that if she submits to a Warrior he must accept her or kill her. Talena was the daugter of a Ubar and thus a member of the Red Caste. It seems obvious then that our second inquiry must be answered negatively. The Warrior Caste and Gorean society would not permit women to train as Warriors. It may not be an explicit prohibition in the novels, but it is supported by many factors. You cannot just assume that because an explicit prohibition does not exist, that it is allowed. You must examine all of the surrounding factors. The logic concerning caste welfare may be the strongest reason for banning female Warriors. Caste is extremely important to Gor and the welfare of that Caste will outweigh individual ambitions. For those who feel women Warriors are true to the books, what are your reasons? Where is the support in the novels? Most will only claim that there is no explicit prohibition. Others will point to Tarna, Panther girls and Talunas. Others will state they know plenty of strong women on Earth. Yet, these arguments are only considering the capabilities of women. They do not deal with how Gorean society would accept such women. Where in the novels is there support for the acceptance of female Warriors by the Red Caste? Such support does not exist. Women "Warriors" “Are you of the Warriors?” asked Labienus. “He says he is,” said a fellow, glumly. “What is the 97th Aphorism in the Codes?” inquired Labienus. “My scrolls may not be those of Ar,” I said. To be sure, the scrolls should be, at least among the high cities, in virtue of conventions held at the Sardar Fairs, particularly the Fair of En´Kara, much in agreement. “Will you speak?” asked Labienus. “Remove the female,” I said. “He is a Warrior,” said one of the men. One of the men lifted the bound Ina in his arms, one hand behind the back of her knees, and the other behind her back, and carried her from where we were gathered. In a few moments he returned. “The female is now out of earshot?” inquired Labienus, staring ahead. “And the answer?” inquired Labienus. The men regarded one another. “And what is that?” asked Labienus. “He is of the Warriors,” said a man. Plenius turned away, stricken. The essay, which was taken from the scrolls of Luther, explains many instances where women as warriors is not only impossible but a concept against the very gorean belief in the natural order of things. It is said that the average woman on Gor possesses the same physical strength of a fourteen year old boy. How then could a woman effectively wield a sword? How could a woman lift a shield? How could a woman bend the long bow? They cannot. Yet while physical strength does not define a Rarius, the codes do. Above is a quote taken from Vagabonds of Gor in which Tarl is asked what the ninety seventh aphorism of the codes is. Before he will answer he demands that the woman, who is a captive free woman, is removed from earshot. This indicates that a woman was never to hear of the codes. How can a woman, who may not know of the codes, be a Rarius? She can not.